What does beer pong mean? Beer pong is a drinking game in which the object is to throw a ping-pong ball into an opponent’s cups (which are full of beer). If a ball makes it into a cup, the opponent must drink the beer from that cup. Where does beer pong come from? The name beer pong combines ping-pong, from the table and equipment, with beer. In a 1972 letter to the New York Times, a Dartmouth College student describes beer pong as a game “played on a regular ping-pong table with the same equipment, but with one addition—a cup of beer is included.” In this version of the game, which is still played at Dartmouth, players volley the ball back and forth with the aim of hitting the opponent’s cups or landing the ball in the cup. When this is achieved, the opponent drinks the beer and removes the cup. A team wins when their opponents have no cups left. Jere Daniell, a history professor and member of Dartmouth’s class of 1955 has reported playing a rudimentary game involving cups of beer on a ping-pong table during his undergraduate years. A version of the game without paddles, more similar to the beer pong commonly played today, developed in the 1970–80s. In 2011, Bucknell University’s (Pennsylvania) campus newspaper claimed that the paddle-less version, called throw pong, was invented there in the 1970s; the article is accompanied by several photographs from the era. The typical setup for this style of beer pong is a triangle of cups at each end of a table (either a ping-pong table or a purpose-built one). Teams of two throw the ball, aiming to get it into the opponents’ cups. As in the paddle version, when the ball goes into the cup, that team must drink and remove the cup. A team wins by eliminating all of the opponents’ cups. Beer pong is also sometimes known as beirut, although the origin of that name is unclear. Members of two different Lehigh University (Pennsylvania) fraternities claim to have coined the name beirut in 1983 and 1986 respectively. Both invoked then-current conflict in the Middle East—specifically Lebanon, whose capital is Beirut—and visually likened the balls landing in the cups to air strikes. 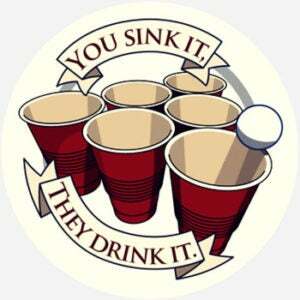 An adult party game, beer pong is frequently associated with college parties, fraternities, and binge-drinking. Although beer pong started as a DIY game, often played by fraternity members, some companies now market beer pong sets and bars may feature beer pong. Anheuser-Busch, for example distributed Budweiser branded Bud Pong sets for promotional use in bars in 2005. Beer pong was even featured in some popular comedy movies in the 2000s, including Beerfest, Road Trip: Beer Pong, and 21 and Over. Some players have adapted the game to different beverages, playing wine pong or shot pong (using plastic shot glasses and liquor). Rapper Lil Pump even appeared in an Instagram video in which he sets up to play lean pong, referring to lean, or purple drank, the recreational drinking of cough syrup. Informal polls show that the game is more often called beer pong than beirut. One poll conducted by College Humor found that beirut is more commonly used on the East Coast of the United States than in the rest of the country.